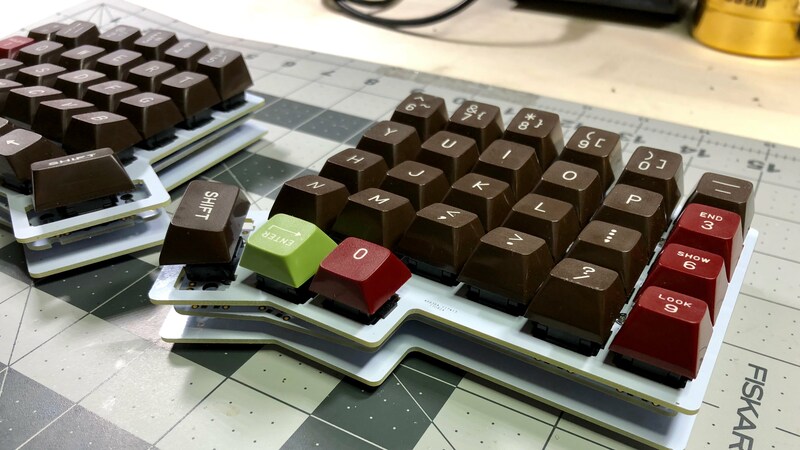 The Iris ergonomic split keyboard first appeared on my radar in September, when u/Bakingpy of Keeb.io posted a picture of the first Iris prototype on r/mk. 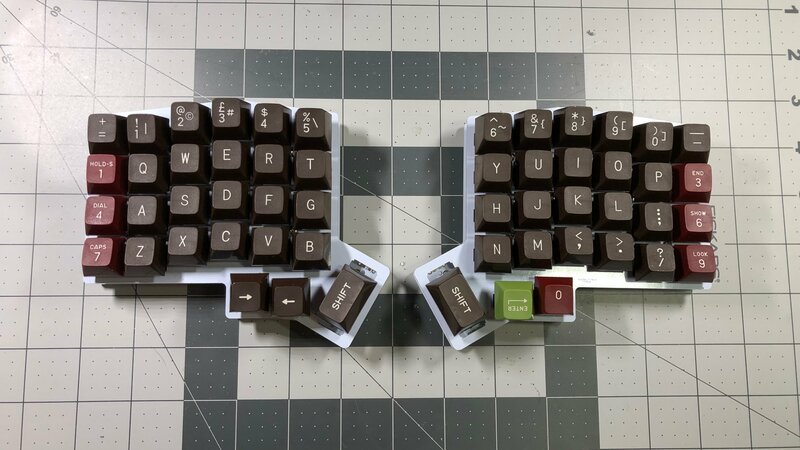 Since building my test ErgoDox I’ve taken a serious interest in split keyboards, and was actively on the hunt for another split board. 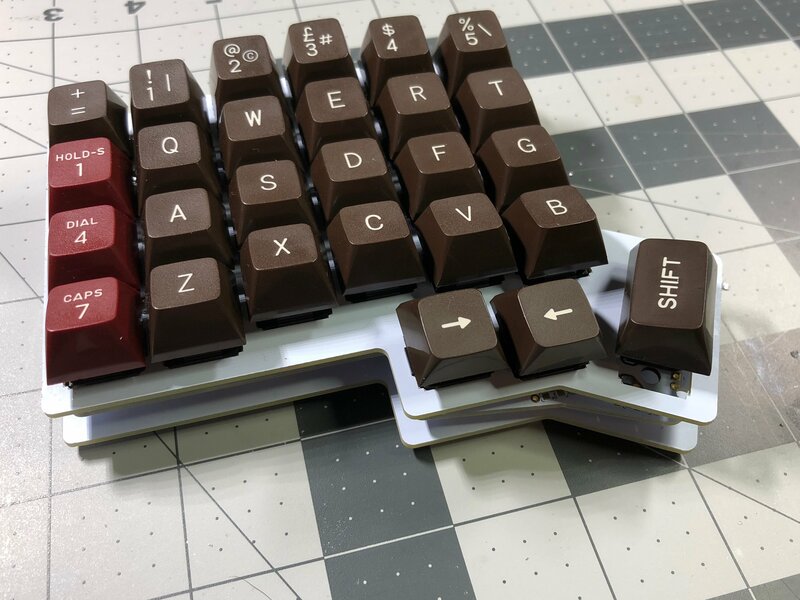 Most of the selection out there like Let’s Split and Orthodox are based on the 40% layout, as opposed to the 60% layout. While innovative and filling a niche, I find the 40% footprint to have too few keys for me, so something based on a 60% was what I was after. Prior to seeing Iris, I’d taken an interest in the Dark Matter split keyboard. While 40% based, I loved the look, and had started some tentative plans to design and build my own custom split board. I even ordered MT3 keycaps to fit my hypothetical board. What caught my eye about Iris is its layout. 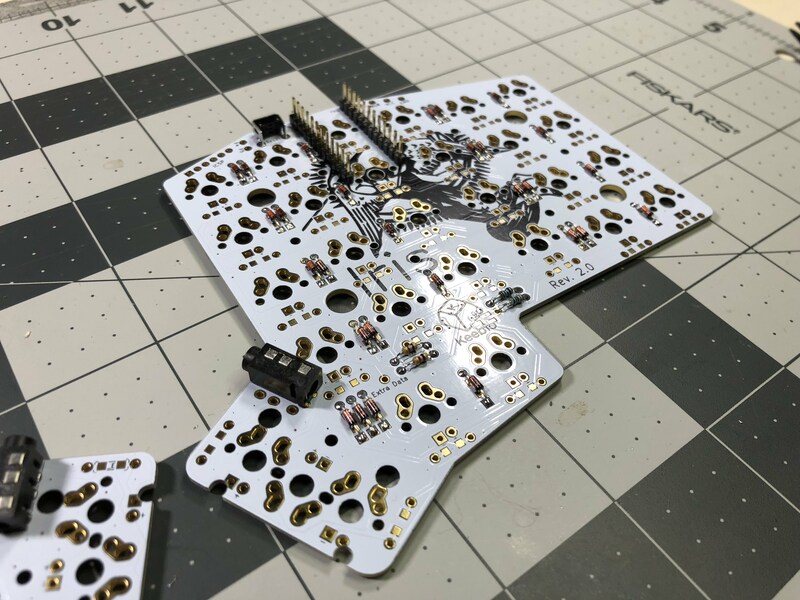 Iris is laid out almost identical to the split board idea I’d been toying with. I knew as soon as I saw it that I had to have one. 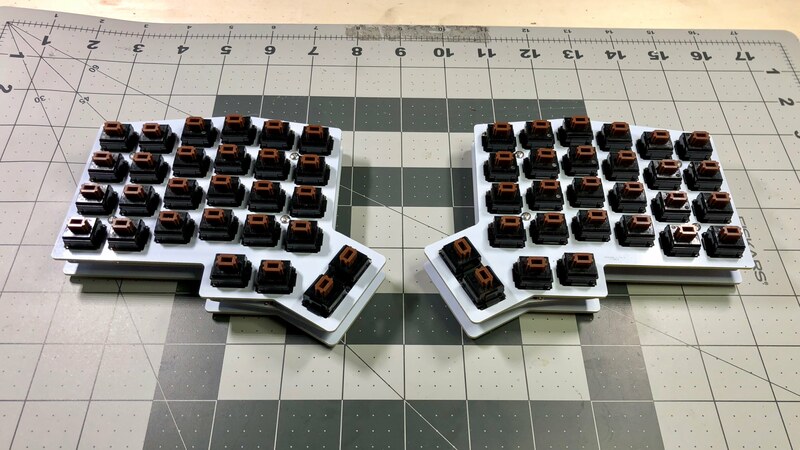 Iris uses the same column stagger that ErgoDox does. 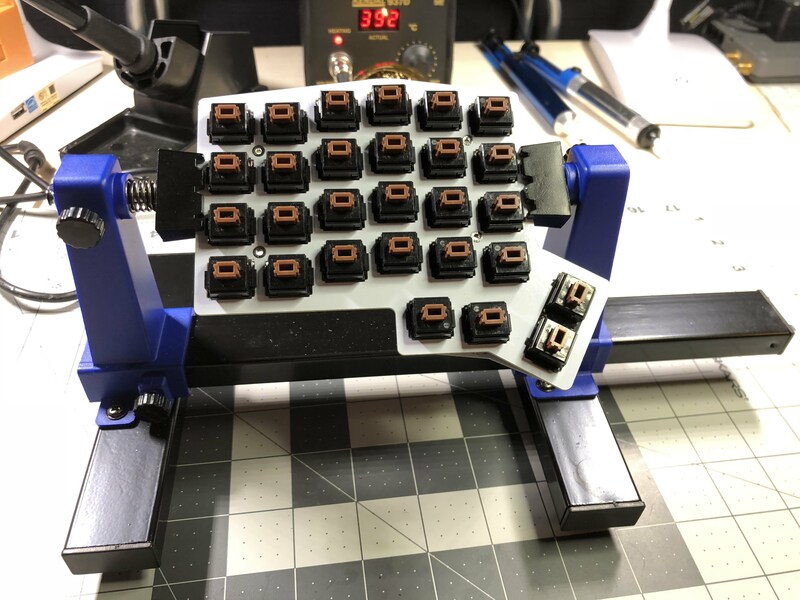 It omits the inner 1.5u keys and most of the thumb cluster, opting for a single thumb key as opposed to the two side-by-side thumb keys on ErgoDox. 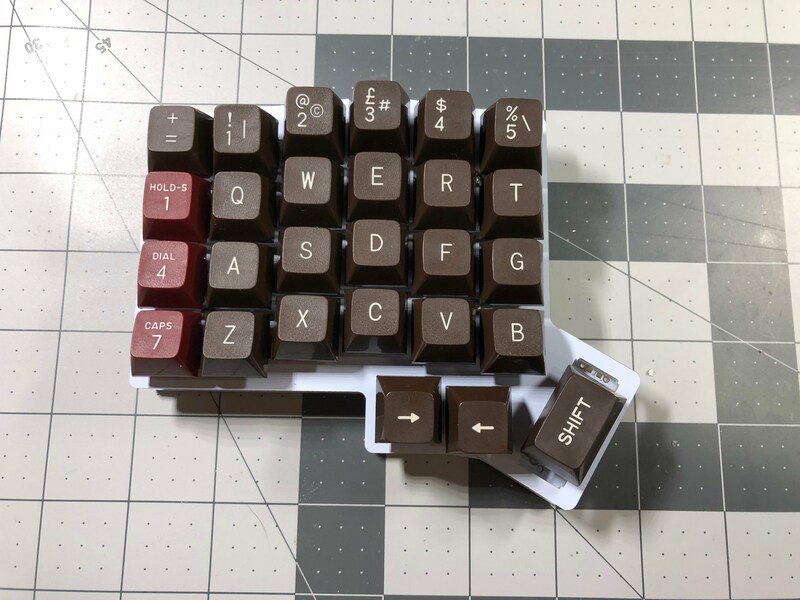 Iris’ firmware and pin out are based on Keeb.io’s NyQuist split keyboard (another ortholinear split board), which is in turn based on Let’s Split. Iris also supports RGB underglow, LED backlighting, and can use MX or Alps switches. Pricing for Iris is extremely budget friendly - the PCBs, controllers, and case are just $70 combined. Significantly cheaper than the $100+ one would pay to get started on an ErgoDox. This board is actually inexpensive enough that I ended up ordering two! At launch, Iris was available with black, white, or blue PCBs. Cases were available in black PCB material or white acrylic. 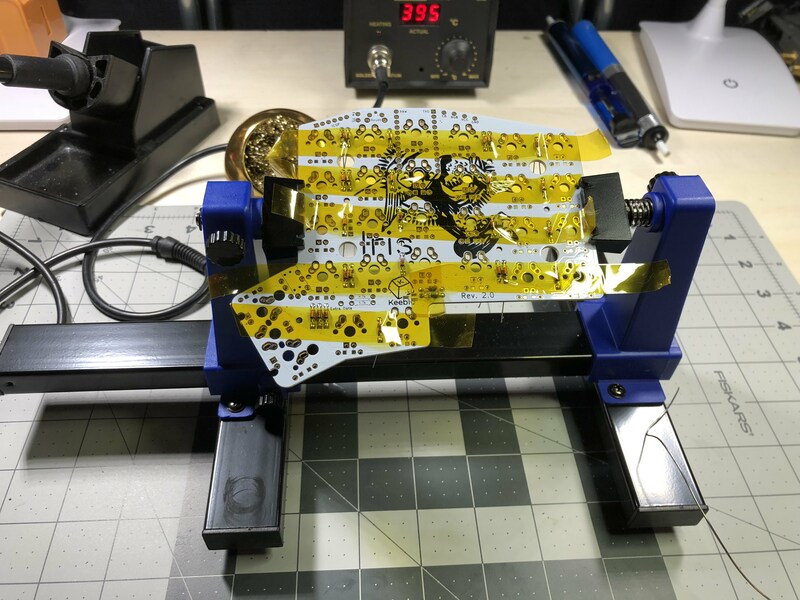 There’s been a trend lately of folks using PCB material for keyboard plates (popularized by the Mitosis keyboard). 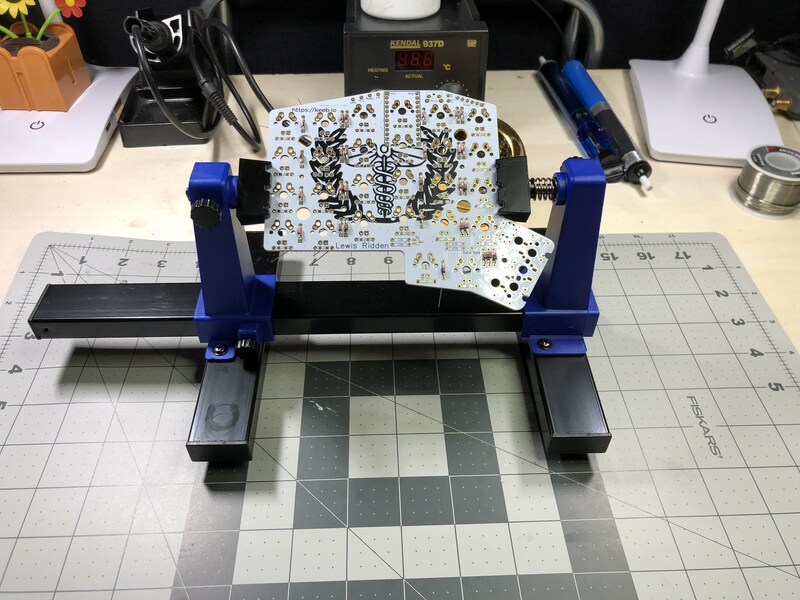 PCB material is great, it’s nearly as strong as metal plates, but at acrylic plate pricing. While white material plates were not offered at launch, I was able to score a set from Keeb.io out of the remainders of prototype plates. I love the contrast between the white plates and brown keycaps - it really makes this board pop. 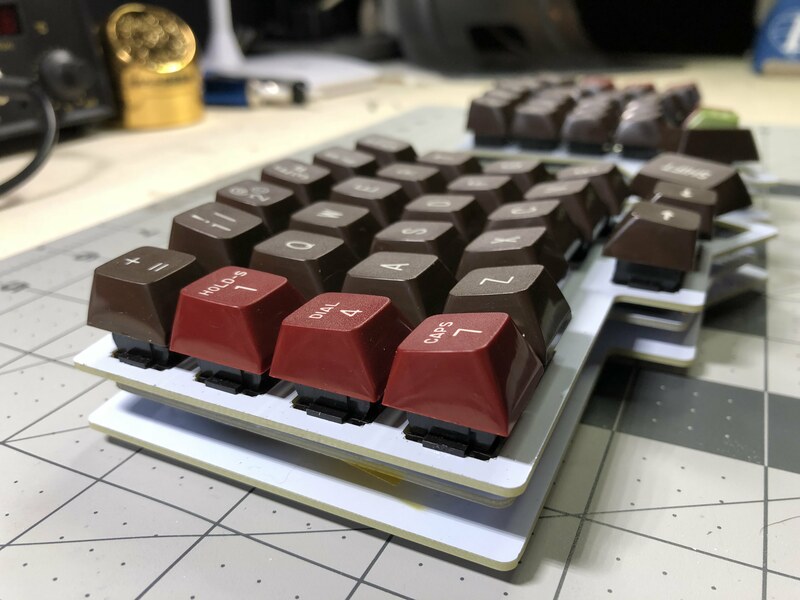 For the white Iris build I saw an opportunity to finally make use of a set of Brown Alps switches I’d been holding on to for over a year. To my knowledge brown alps were only ever in the IBM 5150 and Magnavox VideoWriter keyboards. When I bought them, they were still soldered to the 5150 keyboard. I bought the board without any specific project in mind, but I’m very glad that I did. They’re a lovely heavy tactile switch, with a strong, crisp tactile bump right at the top. They feel fantastic and might be my new favorite Alps switch; I’m glad to have finally had the chance to use them on something. In keeping with my other Alps build (white and blue), this board has keycaps that match the switches underneath them. With brown alps switches it’s only natural to use brown keycaps. I scored these on r/mechmarket after I ordered the Iris parts, so the timing was perfect. These keycaps are from the One Per Desk computer keyboard. The board these come from actually isn’t mechanical, it uses sliders over membrane, fortunately these are still compatible with Alps switches. If the brown + red colorway seems familiar, you may recognize it from SA Retro. As it turns out, the One Per Desk served as the inspiration for that keycap set. For this build, I used a PCB holder for the first time. I’ve seen them on other build logs and have meant to buy one for a long time. The holder was a god-send for this build, and greatly simplified the process. 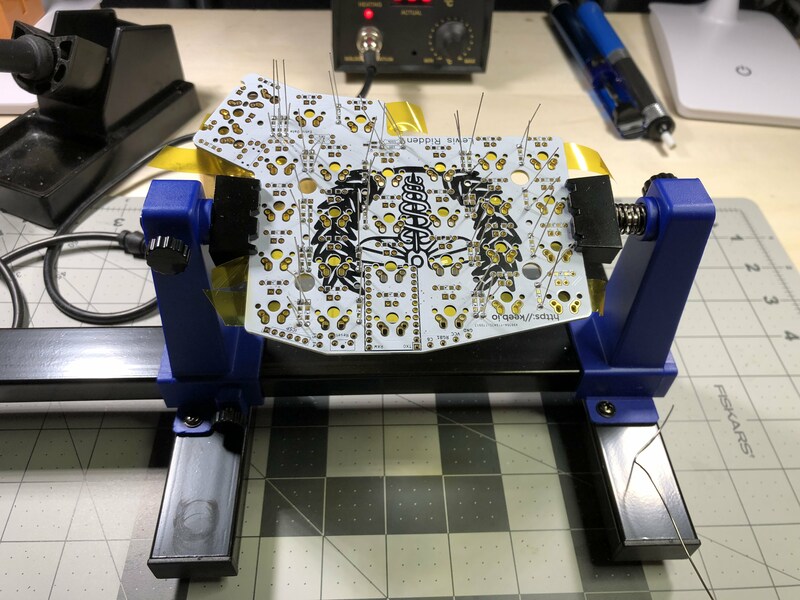 Assembly of Iris begins with soldering on diodes. Diodes are what gives a keyboard matrix n-key rollover. Diodes install on one side of the board, and are soldered on the other. I typically tape diodes down during soldering so that they don’t fall out. 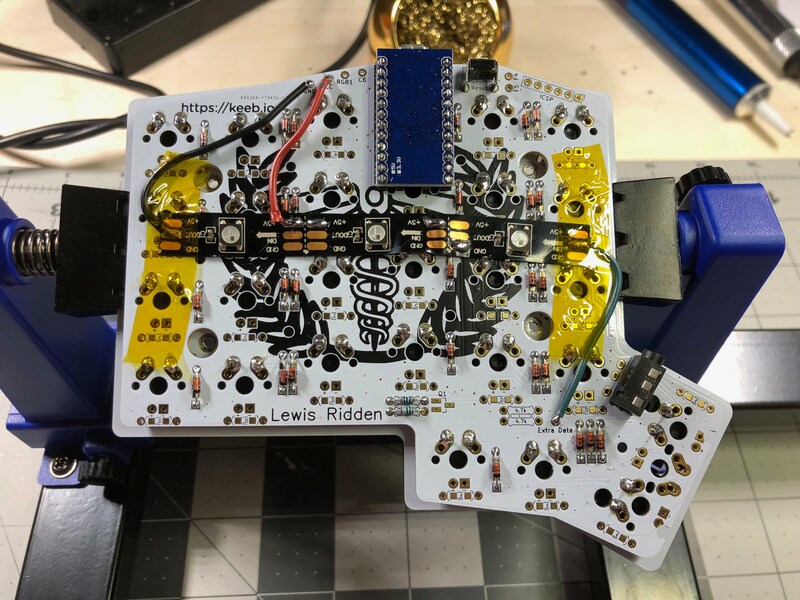 After soldering diodes, headers for the Pro Micros are installed, along with a right-angle reset switch and TRRS jacks. Iris uses common TRRS cables over serial to connect the two halves. After the somewhat tedious task of prepping the PCBs, it’s time to solder on switches. Following switches, it’s time to solder on the Pro Micros. Note: during the initial build of this board I soldered both Pro Micros on with the same orientation. Desoldering a Pro Micro is a big pain. Don’t make the same mistake I did. Be sure to solder on the Pro Micro on the left with components up, and the right side with components down. With control electronics soldered on, the last (optional) step of assembly was to add RGB LED strips to each hand. The Iris PCBs were designed with RGB underglow in mind. 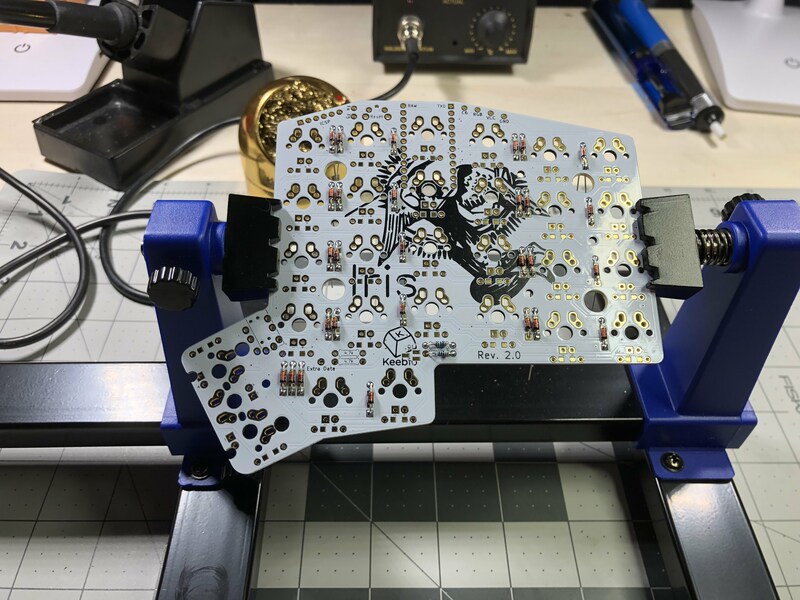 Previous boards I’ve build with RGBs have involved soldering directly to pins on a controller chip, this PCB has dedicated pinouts on each hand, greatly simplifying the process. Lastly I assembled the case, and assembly was done. 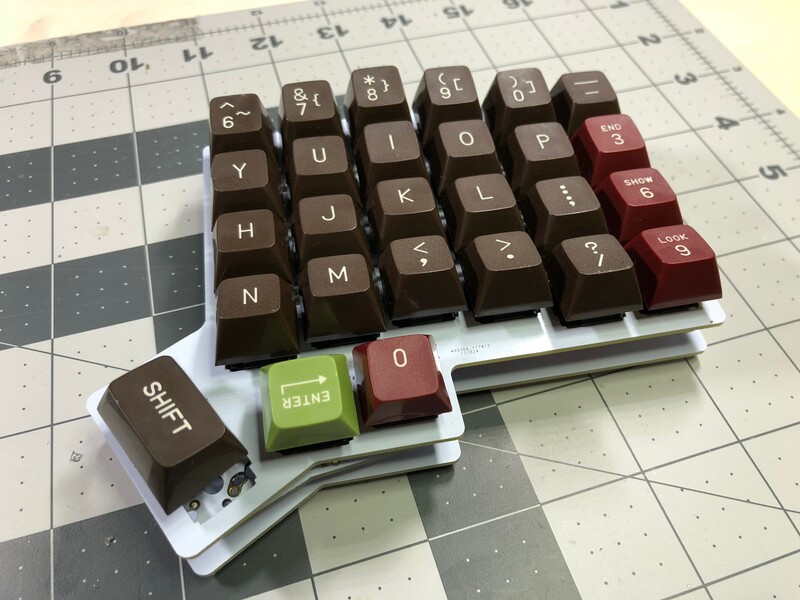 Iris runs on QMK, my keyboard firmware of choice. The keymap files have been merged into the main QMK repository and are available here. Now, you can have really simple definitions above you keymap, then drop the arbitray keycode into the keymap. My Iris keymap is below. 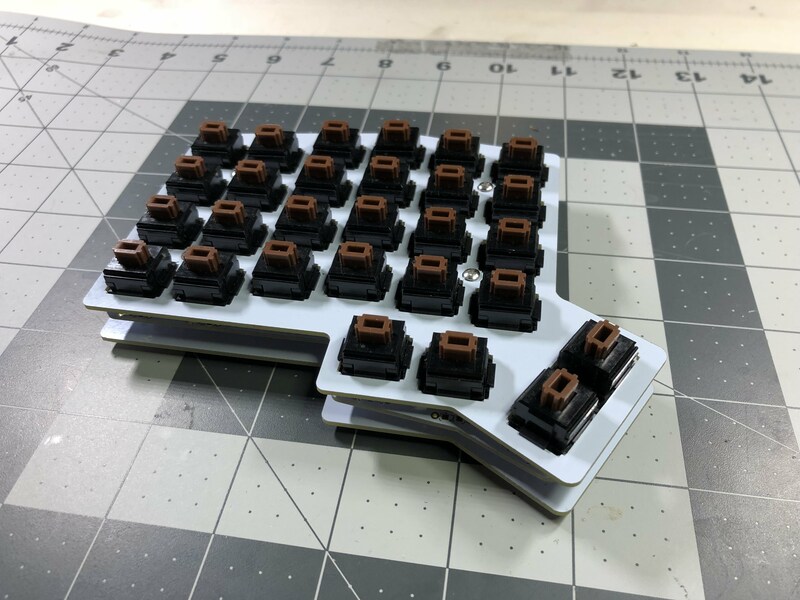 Mostly an adaptation of my ErgoDox keymap, combine with how I typically lay out my 60% boards. I’ve been really quite pleased with this board. 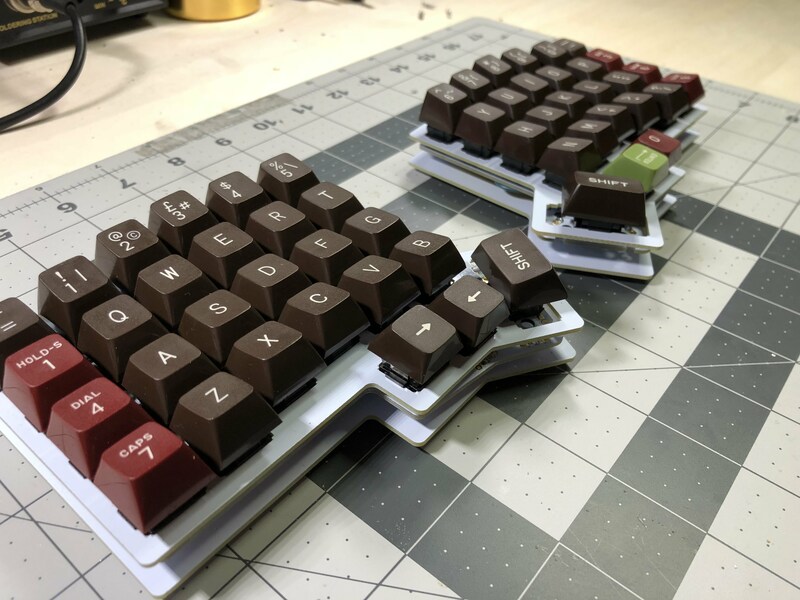 It’s my first split since my test ErgoDox. I love the look, I love how compact yet functional it is. While Iris has fewer keys than ErgoDox, I find it nearly as productive. There’s a LOT of functionality baked into such a small board. I’ve been daily driving it at work for a month or so now and have been loving it. The brown alps switches are just glorious. The keycaps feel great, and I love just looking at the thing. Coming soon I’ll have another Iris build (as soon as keycaps arrive) - the next one will use a black case, Otemu Ice switches, and Russian MT3 keycaps. Stay tuned!